Chicken is an economical type of meat. Sometimes chicken gets a little boring. You don’t need to reach for that box of ‘Shake and Bake’. You can make your own special recipe. The cinnamon, honey, and fresh lemon juice add a very yummy taste to oven fried chicken. If you are looking for a way to dress up chicken, check out this recipe. This recipe came from a fellow viewer just like you! Oven Fried Cinnamon Honey Chicken is a delicious way to prepare chicken. Preheat oven to 350 degrees. Combine flour with all spices. Beat egg and milk. 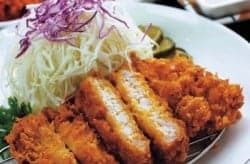 Coat chicken pieces with flour. Combine breadcrumbs with egg mixture to form a soft moist mixture. 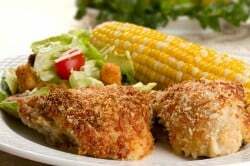 Roll floured chicken pieces in moist crumb mixture and arrange skin side up in roasting pan. Sprinkle with the oil. Bake about 40 minutes or crisp and brown. The last 15 minutes pour over the combined melted butter, honey and lemon. This recipe works well with skin removed. I make this all the time, but tweaked it a bit. I cut chicken breasts into pieces, coat it, and fry it in oil. It is absolutely perfect with sweet potatoes! This recipe was excellent. I think when I try it again in the future I will cook it on a charcoal grill to get it a little crispe and to get a bit of smoked flavorr.